The blues is both a style and a chord progression. The blues chord progression can be played in any style ( funk, country, etc.) Something can be played in a blues style but not use the blues progression. Confusing? Well for the moment we are going learn to play a blues progression in a blues style. The following 12 bar* chord progression is one of the most commonly used variations of the blues, so I will use it as a starting point. Later I will show you some other common variations. This example is in the key of A and consists of three chords ( A, D, and E ). You could also replace them with 7th chords ( A7, D7, and E7 ). Start by strumming the basic major or 7th chords to get the feel of the progression. 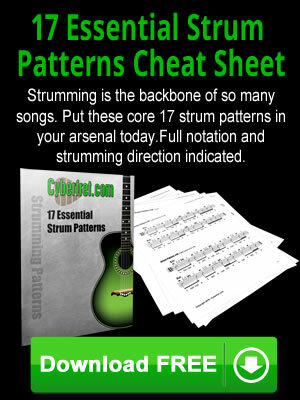 You can use a strum pattern that you are familiar with, or just strum once on every beat. The 12 measures can be repeated any number of times until the end of the song, at which time you will end by strumming the final A chord once. There are a lot of endings that could be played, but we will keep it simple to start with. If there is a measure without a chord written above, this means to keep playing the chord from the previous measure. Use the following two MIDI files as a background to play along with.